The house is beautifully decorated. The tree is up. Stockings are hung, but can you check Christmas shopping off your list? With only a few shopping weeks left, I started to panic about finding the perfect gifts for a few family members. They seem to have everything or are difficult to shop for in general. While Hendricks County is home to many wonderful, locally owned shops, I thought perhaps homemade presents would be a great option for my gift-giving needs. Hendricks County boasts many Do It Yourself studios, and I was happy to find no previous experience with DIY projects is necessary. Without exception, knowledgeable staff members give step-by-step instructions, and the studios provide all the materials needed. 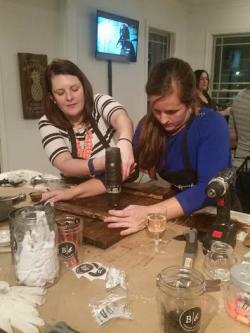 They even offer fun, family-friendly holiday events to create keepsakes for your own family or gifts for others. Making homemade gifts has never been so easy, and the experience provides quality family time with your children and lasting memories. Even if all your Christmas shopping is complete, you may need fun activities during the kids winter break. All the studios listed below either welcome walk-ins or are just a few clicks away from registering for a project! Santa and Me Day - Dec. 9 from 11:30 a.m.-2 p.m.
Don&apos;t miss this opportunity to create a family heirloom or a gift for grandparents. 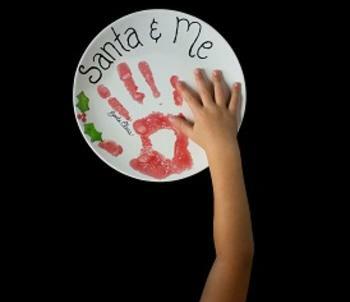 Not only will Santa put his hand or thumb print on your decorated piece, afterward he will also have time to visit and take pictures. Reservations are required for this event. When you register, you have a choice of five pottery pieces at various prices and must pay a $20 down payment. The remainder is due upon arrival. The staff will help with design choices, color combinations and getting the right supplies. Clay Paw Prints - Dec. 10 from 2-4 p.m.
Bring in your cherished pet for an opportunity to create a personalized clay ornament. Staff members will help you decide on a pattern that works best for your dogs size, then put the dogs print in the clay, and paint on the dogs name and year. This event costs $12. Click here to register. I love personalized Christmas decorations. Whether for your own home or a gift for someone, this is the ideal event to create a beautiful Christmas platter. Four choices of platter shapes and sizes are available which requires a $20 deposit (remainder is due upon arrival). Register here. When you arrive, you have many design choices and can opt to have a family name included. All supplies and materials are provided. This is a great activity for the family. Bisque Barn Pottery Paint Studio, 9778 U.S. 36, Avon, offers walk-in painting on pottery, wood signs, glass or canvas. No experience necessary and the staff will guide you through the entire creative process. The studio is open seven days a week. Pottery Painting Class - Dec 14 from 6-8 p.m. 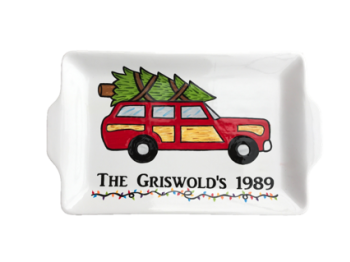 I think I found the perfect gift for a certain family member or may keep it myself, a National Lampoon&apos;s Christmas Vacation themed platter! Your reservation includes a platter, supplies and step-by-step instructions. Pictured on the pottery piece is the Griswolds station wagon with the huge tree on top. You can personalize it by using any last name and date. This class costs $42, and you can reserve a spot online or call the Plainfield location at (317) 406-3072.
uPaint Pottery Studio, 1820 E. Main St., Plainfield, is a walk-in studio where you can paint your own pottery or create a fused glass project. No experience is required as the staff helps with colors and design. All the materials are provided and they clean up the mess. Finished pottery pieces can be picked up in five to seven days. Please keep in mind Dec. 18 is the last day to paint to guarantee for Christmas. uPaint Pottery Studio is open 7 days a week. Preschool Story Time At The Lab - Dec. 12 at 10:30 a.m., Dec. 13 at 6:30 p.m. or Dec. 15 at 10:30 a.m. The December story time features "Bear Stays Up for Christmas." The Wednesday evening session will even include a special guest....Santa. 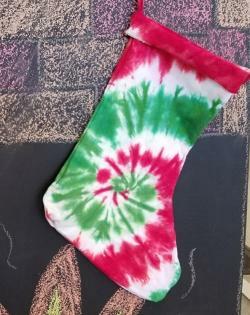 After the story, you and your preschooler will enjoy creating a tie dye Christmas stocking. A small snack and hands-on themed craft is provided while you wait to rinse out your items. Cost is $18 a child and reservations are required. To reserve a spot send an email to carver@thetiedyelab.com, call (317) 483-7903, or send a Facebook message with your name, phone number and child&apos;s name. Homeschool Holiday STEM Activities - Dec. 13 from 1-2 p.m.
A state-licensed science teacher hosts the three hands-on holiday STEM (science, technology, engineering, math) activities. The experiments are appropriate for children ages 5-8. They can even take two of the projects home. Cost is $10 and homeschool science participants receive a 20 percent discount. Sounds like the perfect opportunity to make a gift for someone. Plan on staying an extra 45 minutes if you plan to tie dye. Reservations are required. The Tie Dye Lab, 8100 E. U.S. 36, Suite L, Avon, provides a unique opportunity to create your own tie dye apparel and take it home immediately. It&apos;s the perfect gift for fans of tie dye apparel. The Tie Dye Lab is a walk-in studio, so no reservations are needed unless your group is 10 or more people or you are participating in a special event. All ages are welcome but those 8 and under may need extra help from parents. The lab has a variety of apparel choices, colorful dyes, designs and provides all the supplies and cleans up the mess. Prices depend on the type of apparel. They are open every day but Monday. Pick Your Project- Kid Friendly 12 and Up - Dec. 14 from 6-9 p.m.
Board & Brush provides a wonderful opportunity to spend time with your older children. This studio boasts a gallery of 100-plus designs for your wood sign. While registering for this class, you choose your sign (it shows the dimensions) and customization needed for your selection. When you arrive at the workshop, the materials will be provided and step-by-step instructions given. What a fun way to create beautiful decor for your home or for a gift. This popular workshop costs $65, and pre-registration is required. Board & Brush Creative Studio, 442 Main St., Brownsburg, welcomes craftspeople of all skill levels. During this DIY project, you will learn how to distress wood, sand and assemble boards. Please note, almost all classes require participants to be at least 16 years of age. Check the online calendar for classes that allow children ages 12 and up. Pre-registration is required for all classes. Materials and instructions are provided upon arrival. Painting With A Twist&apos;s motto is, "This is fun art, not fine art." They boast a casual, creative atmosphere. The process of creating a painting is easy, and no experience is necessary. Everyone paints the same picture using acrylic paints on canvas. A knowledgeable instructor gives step-by-step directions, and all materials are provided. Painting With A Twist, 8111 E. U.S. 36, Avon, is conveniently located at the corner of Dan Jones Road and U.S. 36. All classes require pre-registration at which point you can see the picture. Be sure to check age restrictions as some are 18+, 15+, and 5+. Here is a list of upcoming, family-friendly (5+) classes. Please note, although the minimum age is 5 years, some classes are more suitable for older ages. Prices range between $25 and $35 per seat. Click here for more information, view calendar of classes and featured pictures and pre-register.